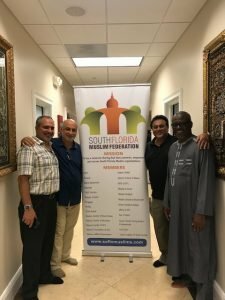 Miami, August 31st, 2018: The South Florida Muslim Federation was hosted by one of its newest members, Islamic School of Miami, at a wonderful community gathering with fruitful conversations about the the past, present, and future of the Muslim community in South Florida. ISOM Board members Bilal Karakira, Mohammed Farouk, and Naveed Anjum, were present. 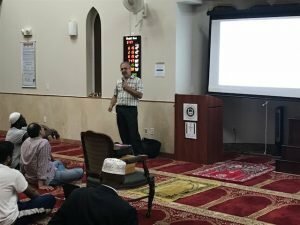 Also community member Rashid Abbara delivered a talk to the community about the importance of this effort and to work and support the South Florida Muslim Federation for unity and collaboration. 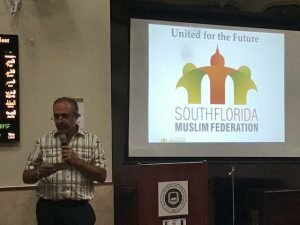 Community members heard the latest updates and developments regarding the South Florida Muslim Federation and its activities. Samir Kakli, from the Federation Executive Committee, delivered a presentation on the Federation’s history, in addition to its key principles: Representation, and Transparency. From its inception in 2017, the selection of leaders, the mission, bylaws, and all other major decisions for the Federation have been done out in the open with the community leaders input. This process has now been formalized with bylaws, with membership and voting. These will be the key principles going forward, long into the future, Inshallah. 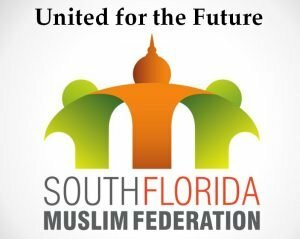 We extend our heartfelt gratitude, as well as warm welcome, to the Islamic School of Miami as one of the Federations newest member! Stay tuned for further exciting updates on the way. See here for the full list of current Federation members. You can download the full presentation that was delivered by clicking here.